When it comes to cookware for your smoker or grill, cast iron rocks. From its tough black look to its wrist-bending heft. There's its primal connection to past generations of live-fire hearth masters. When it comes to cookware for your smoker or grill, cast iron rocks. From its tough black look to its wrist-bending heft. There's its primal connection to past generations of live-fire hearth masters. And last but not least, its versatility. With a well-seasoned piece of cast iron, you can sear, braise, bake, fry, stew, pan-roast, and even smoke. Cast iron's bona fides (and strong connections to food) were established more than 2,500 years ago -- the Chinese may have been the first to pour molten iron into molds to make both plowshares and cooking pots. For grillers, nothing lays on grill marks like a cast iron grill grate. Indeed, a Tuscan grill enables you to grill in your fireplace -- especially useful during winter. A cast iron grill press gives you superlative pollo al mattone (chicken under a brick), while a plancha enables you to combine metal plate searing with smoking. Spaniards and Argentineans rely heavily on fire-heated cast iron to cook seafood, vegetables, and of course meats. Other cast iron pieces appreciated by modern pit masters and camp cooks are skillets, griddles, dutch ovens, pizza pans, and woks. Sear beef or pork steaks; burgers; chops; chicken breasts, legs, or thighs; salmon or other fish fillets; sea scallops and shrimp; and even tofu on a hot cast iron plancha or skillet. Smoke-roast potatoes, yams, Brussels sprouts, broccoli or broccoli rabe, cauliflower, mushrooms, carrots, parsnips, or other root vegetables in a cast iron skillet. Use to make smoky fruit crisps or bread pudding. Grill breakfast. Cast iron was meant for bacon, corned beef hash, and hashbrown potatoes, not to mention eggs, pancakes, sausages, and one of my favorite morning indulgences, a Mile High Pancake. Make an epic pot of stew or chili--here's a recipe for chili verde with cornbread. Use a cast iron skillet or small pot as a receptacle for smoking chips, soaked or unsoaked. 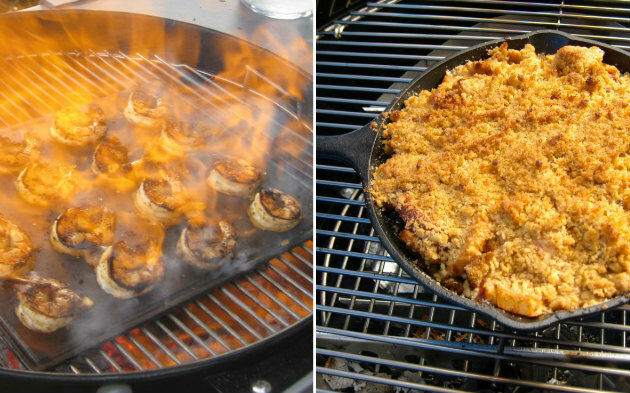 For tips on maintaining cast iron and for more recipes using cast iron cookware, visit BarbecueBible.com.